You may already know that Algorithmia hosts scalable deep learning models. If you are a developer, you’ve seen how easy it is to run over 3,000 microservices through any of our supported languages and frameworks. But sometimes it’s nice just to play with a simple demo. The Deep Fashion microservice is a deep CNN, performing multi-category classification, which has been trained with humans in the loop to recognize dozens of different articles of clothing. It can be used standalone to locate specific items in an image set, or combined with a nearest-neighbors service such as KNN or Annoy to recommend similar items to online shoppers. And since the service provides bounding box coordinates for each item within the image, it could even used to censor or modify images themselves. 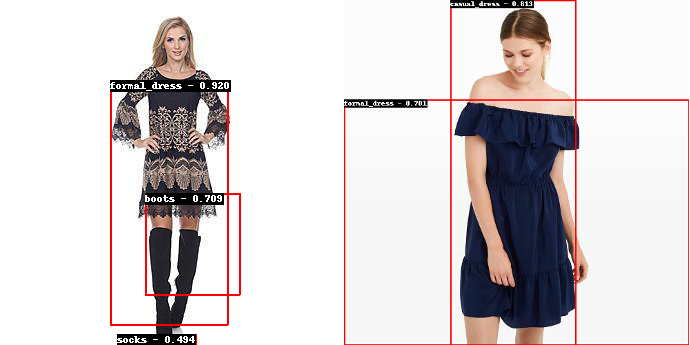 To see it in action, just head over to the Deep Fashion Demo, click (or upload) an image, and watch as state-of-the-art deep learning models scan the image to identify clothing and fashion items.